PORTLAND, Ore.--(BUSINESS WIRE)-- Columbia Sportswear is unveiling the Star Wars™: Empire Crew Parka – a limited edition jacket inspired by the original cast and crew while filming the iconic ice planet Hoth scenes of Star Wars: The Empire Strikes Back. The themed jackets will be available on columbia.com/StarWars starting at 12:01am EST on Dec. 7 and in-store at select Columbia-branded retail locations in the U.S., Canada, Europe, China, Hong Kong, Japan and Korea. This limited edition parka is a unisex style that will be sold for $500 USD, while supplies last. Nearly 40 years ago in the frigid wilderness of Norway, a small group of cast and crew filmed several of the most recognizable scenes from Star Wars: The Empire Strikes Back. 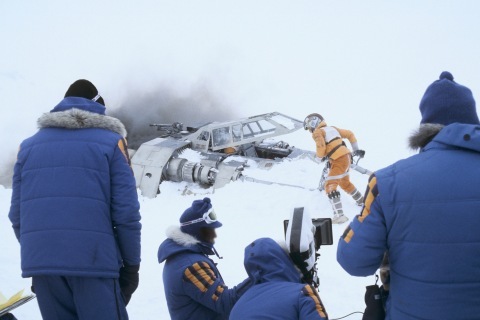 They needed serious winter gear to help protect them from icy winds, whiteout blizzards and sub-zero temperatures encountered on location while filming the iconic Hoth scenes. To help address the weather-related challenges, producers arranged for each member of the Norway team to receive outerwear that included a colorful insulated parka for the multi-week shoot. Created to stand up to the cold conditions, that jacket features a unique design that currently make it one of the most sought-after items among Star Wars collectors. Only a handful of those original jackets exist today, but now fans can go behind rebel lines—and deep behind-the-scenes—with Columbia’s limited edition Star Wars™: Empire Crew Parka. The Star Wars™: Empire Crew Parka honors the original design while incorporating Columbia’s weather-defying technologies to help protect against extreme winter conditions. The waterproof, breathable and critically seam-sealed outer layer acts like the Echo Base shield generator to protect against the elements, while the Omni-Heat™ thermal-reflective lining and insulation will keep you as warm as a Wookiee. The jacket features a removable, adjustable hood with removable faux-fur trim, two-way collar, ribbed comfort cuffs, wrist zips and multifunctional pockets. For high-resolution images of Columbia’s Star Wars™: Empire Crew Parka, plus behind-the-scenes images from the film, visit this link. For more information, visit columbia.com/StarWars. Join the conversation by following @columbia1938 on Twitter and Instagram, and @ColumbiaSportswear on Facebook. Columbia, the flagship brand of Portland, Oregon-based Columbia Sportswear Company (Nasdaq: COLM), has been creating innovative apparel, footwear, accessories and equipment for outdoor enthusiasts since 1938. Columbia has become a leading global brand by channeling the company’s passion for the outdoors and innovative spirit into technologies and performance products that keep people warm, dry, cool and protected year-round. To learn more, please visit the company's website at www.columbia.com.